Bank of America reported a lower-than-expected first-quarter profit and its revenue fell, sending the No. 2 U.S. bank's shares down 3 percent before the bell on Wednesday. Net income quadrupled to $2.62 billion, or 20 cents a share, from $653 million, or 3 cents a share a year earlier as expenses dropped and the bank set aside less money to cover bad loans. But total adjusted revenue fell 8.4 percent to $23.85 billion. Analysts on average had expected Bank of America to earn 22 cents a share, according to Thomson Reuters I/B/E/S. 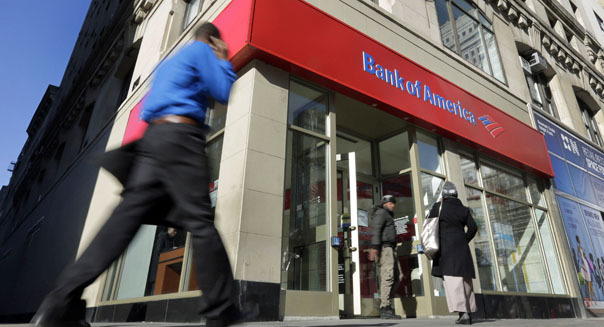 Bank of America Corp. (BAC) shares dropped 3.3 percent before the bell to $11.88. Earnings in the year-earlier period were affected by a host of one-time items including a $4.8 billion charge related to the value of its debt. Chief Executive Brian Moynihan has made progress in building capital and settling mortgage-related lawsuits since taking over in January 2010. But he is under pressure to show that the bank can produce higher earnings at a time of low interest rates, stricter regulations and volatile economic conditions. Bank of America, the last of the big four U.S. banks to report results, has pledged to cut $8 billion in expenses by mid-2015 and has said it could reduce expenses in its division that handles delinquent mortgages by $1 billion by the end of 2013. The bank showed signs of progress in these efforts in the quarter, with total expenses falling 5.2 percent to $18.15 billion. As with other big banks this quarter, Bank of America results were also boosted by reduced credit losses as borrowers did a better job of making their payments. The bank's provision for loan losses fell 29.2 percent to $1.71 billion.